The yellow gold of evening light in autumn changes the colors of those things that it touches as well as the shadows. 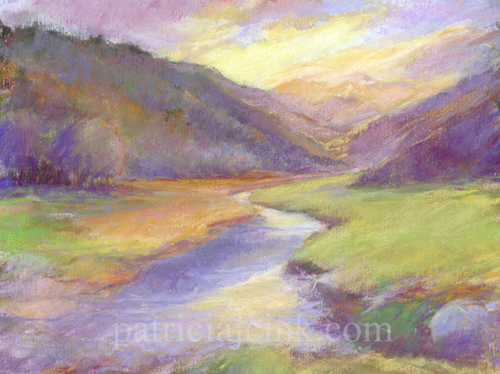 I painted this valley last October plein air, mid-day and was discouraged when the interesting clouds turned to rain and dulled the colors of the scene. I repainted it recently changing the sky to yellow, suggesting higher mountains and let that set the tone for adjustments to the rest of the painting.